I am a member of the Pins and PIne Needles Quilt Guild based out of Whitecourt Alberta and surrounding area. This years Quilt guild challenge we were given a Fat Quarter, A shape, and a color we are to make a child size quilt to display at our 2018 Quilt show then donate to it the local women’s shelter. The fat quarter that I was given is dinosaurs with a white background. I instantly went to my stash to see what i had on hand. I was able to find a lot of the fabrics except green for the background so when i was in my local quilt shop Stitches & Dreams in Drayton valley. 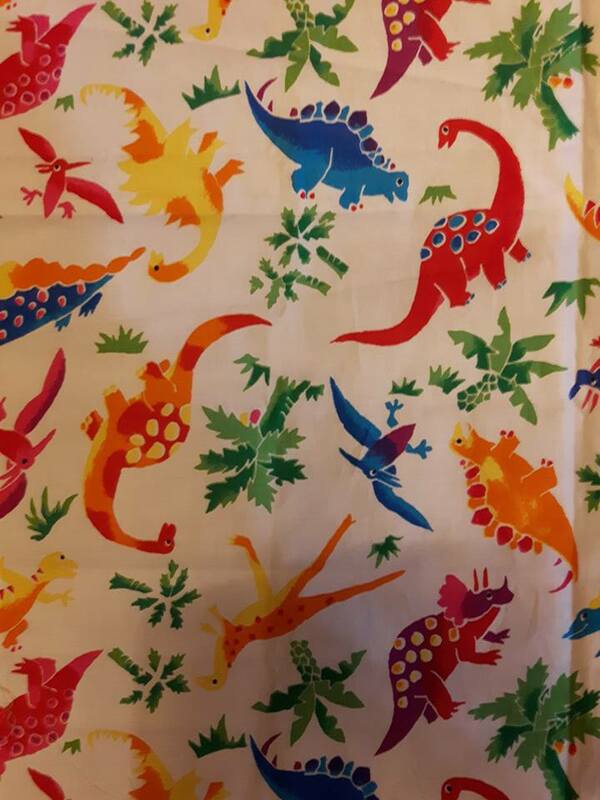 I was able to find a green fabric with printed DINOSAUR all over the fabric.. perfect for the background. This is the grouping of fabrics the i was able to find. The next step in my designing process is to figure out how I’m going to incorporate all the elements FB, Green, Circle into a child size quilt. The next set of pictures is my design process to show you how I started and where I ended. I will keep posting my progress as I work on this quilt. It has a deadline of March 17 2018 so it can be displayed during our quilt show.